This review has not yet been approved by the owner of this writing service. If you are the webmaster of Britishdissertationeditors.co.uk, please Contact Us to approve or remove this review. The website seems to make an effort towards a modern sliding design, but the impression is ruined by ubiquitous stock images (both photos and navigation elements). Speaking of usability, there isn’t even an order form – you are supposed to contact the service’s representative directly and discuss the conditions of your order. There is no price calculator as well – your only alternative is to calculate the price of your order manually. The price per page depends on how soon you want the job done and the type of service you want to order. There are three types: Classic Plus, Professional Plus and Elite Edit. 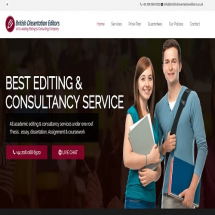 The difference is in the amount of work done by the service: it is either simply proofreading or proofreading accompanying with stylistic and technical editing. Prices range from £8.95 to £39.95 Keep in mind that pages are considered to be 225 words rather than the more usual 275. Available via phone and live chat. All contact forms are pretty invasive and demand you impart your name, email and phone number simply to ask a question about the service, and even after that live chat isn’t online at all times and it may take the operators hours to react to your queries. There are no samples of the service’s writing on the website. It may be because the service doesn’t provide writing but editing assistance, and publishing their clients’ papers would have been not a very good idea. You get a 70% refund if you decide not to use the company’s services after placing an order. All in all, this company leaves a rather dubious impression. Its focus on a single type of work (editing, and dissertation editing at that) speaks about professionalism and ability to concentrate effort. However, the rest of the website isn’t very reassuring: design is lazy, functionality is severely limited, the only way to place an order is via direct contact with the service’s representatives (and even this usually cannot be carried out right away).